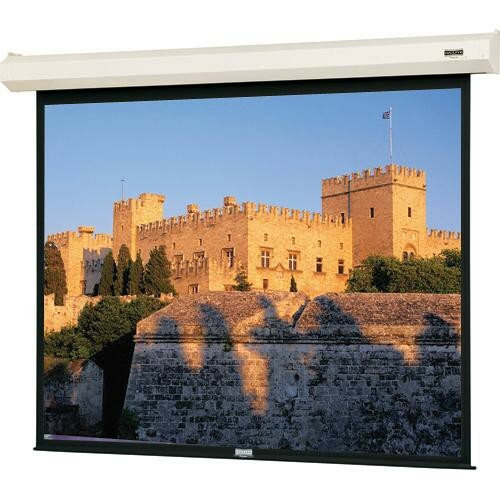 The Dalite 84 x 84" Cosmopolitan Electrol Front Projection Screen is a good, solid and reliable choice for school, business or even home use. This screen is a good choice when either your site, budget or demands do not require a permanently recessed installation. For a basic motorized screen, the Cosmopolitan is the way to go. The built-in motor is quiet and offers reliable and smooth service. The tensioned version of this screen offers a guide cable that maintains even horizontal pressure to hold the surface flat while a custom slat bar with added weight maintains the vertical tension. The Cosmopolitan's handsome white case blends with any decor. Box Dimensions (LxWxH) 105.0 x 8.0 x 6.0"